Taser International, now Axon, offers police free body cameras. A police officer wears a body camera during an anti-Donald Trump protest in Cleveland, Ohio, near the Republican National Convention, July 18, 2016. On Wednesday, Taser International announced it is changing its name to Axon—and that it is offering every police department in the United States free body cameras, plus free software and data storage for one year. This announcement is a big deal, but not because it’s a great boon to policing. It isn’t. Since the Ferguson protests in August 2014, lawmakers, watchdog groups, and even many police chiefs have embraced police body cameras as a tool of accountability. The Department of Justice has offered millions to local departments to purchase them. At first, this widespread enthusiasm seemed justified. A body camera on every cop would, in theory, record every controversial police encounter, and its very presence would deter misconduct. But body cameras have not entirely lived up to that promise. Regulations about how, when, and whether to use them vary widely by jurisdiction. Many police departments have adopted the technology first, intending to figure out the details later. The absence of clear or uniform regulations has prompted concerns that body cameras are becoming surveillance tools of the police rather than an assurance of accountability to the public. In other words, when there are few limits on what can be recorded, it may be that everything and everyone will be. Even as a surveillance tool, we should expect that the police, along with state and local governments, would be the ones to decide what these tools should do. But that hasn’t proven to be the case, either. 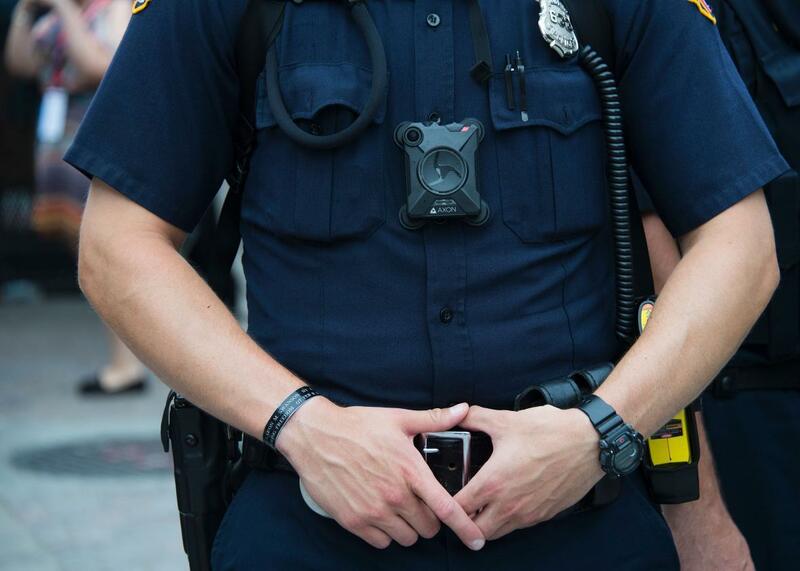 With body cameras, procurement is policy. The model and manufacturer a police department chooses will determine how it’s used in the field. That’s because choices about substantive issues like data production, storage, and sharing are issues of design. Who should be able to decide whether a body camera should be turned on: the officer or someone at the precinct? Should the camera feature a video or audio buffer constantly recording what are often crucial seconds before anyone hits the record button? Should the camera record the video or livestream it? These decisions are made by private companies, not public police departments. No one is more dominant in this field than the organization formerly known as Taser International, which already controls at least three-quarters of the existing police body camera business, according to a July 2016 New York Times article. Building on its existing relationships with 17,000 of the country’s police departments established through its electric stun gun business, TAxon division has cornered the market on body camera contracts. In fact, the body cameras themselves aren’t nearly as profitable as Axon’s cloud service, which stores the massive amount of data generated by police body cameras and offers departments the software to analyze it. Axon’s cloud service subsidiary, Evidence.com, requires police to purchase yearly subscriptions. Every incentive exists to lock in law enforcement agencies early for these recurring, long-term services. Axon isn’t a really body camera company; it’s building a law enforcement platform. In becoming the biggest vendor of police body cameras, Axon is exerting an undue influence on policing itself. Important questions about how body cameras operate and how their resulting data should be treated have been outsourced to a private company. Community oversight over policing is impossible when critical decisions about a surveillance technology have already been made by a vendor. And Axon is eager to remain dominant in the body camera marketplace. Axon CEO Rick Smith has said that he expects to have facial recognition technology in his cameras sometime in the near future. The company recently acquired two artificial intelligence firms, which suggest that the company intends to apply AI to sift through the petabytes of data in its possession. Police body cameras would be instrumental in collecting “one of the richest treasure troves you could imagine” of data for applications like predictive policing. Whether to incorporate these capabilities are private, not public choices. Body cameras require a careful balancing of interests between privacy and law enforcement needs. The resulting data from body cameras, stored for ever-decreasing costs, might one day serve as a virtual time machine for the police, allowing them to watch the movements of people who were not targets at the time their movements were captured. The keys to that time machine ought to be held by governments accountable to their constituents, but it seems increasingly more likely that they’ll be held by Axon.